This is the first game to use the Sanctuary engine from Damwain Games. Sanctuary is a system for telling survival stories over short campaigns, especially concentrating on the relationships within a group of survivors. Frostbite is a post-cyberpunk outbreak survival horror setting by Dutch Sci-Fi author Kelly van der Laan. The city state of Zeniak has been bombed by the Molsavians, with the biological agent Frostbite, it causes people to become singularly obsessed with strong emotions such as rage, love, hate, grief, fear or sadness. The game is for 2-6 players designed to play out in 3-5 sessions and follows the stories of the survivors as they struggle to escape from Zeniak to the safety of Levinski. The obstacles will come in the form of the frostbitten in the streets, the lack of resources on hand to make it, their own self doubt, and even treachery within the group. 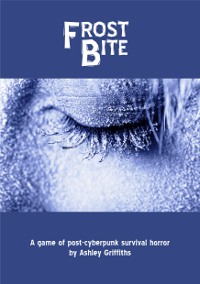 Frostbite is currently in the late internal playtesting stage, I expect ashcan copies to available some time in early 2016 and a final release sometime in late 2014. The generic version of the Sanctuary engine will be made available on a Pay What You Want basis at around the same time. There is a cut down experimental version of the Sanctuary Enging that fits on a pocket mod available here.